The Kentucky Downs meet is a truly unique event that could only take place in Kentucky. The meet, which features only turf races, takes place over just five racing days in early September each year. And it's not your typical turf racing, either. It's like a piece of Europe has been relocated to Kentucky, with an irregularly shaped track and all. The track is shaped like a kidney, so horses have to do a right hand turn to go along with the two standard left turns. The timing is perfect, too - the meet falls right after the end of the Saratoga meet and before Gulfstream and others have gotten interesting, so a lot of top jockeys and trainers are heading to southern Kentucky, just 40 miles from Nashville, to partake in the spectacle. It's a short but truly special meet. This year it has been condensed as too much rain caused the delay of opening day. They'll still race five days but over a shorter period of time. 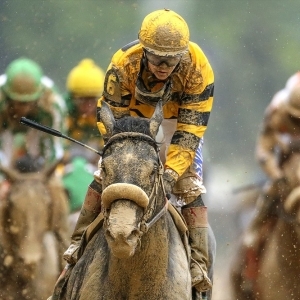 The entire meet is a strong one, sprinkled with plenty of big-money stakes races. The highlight, though, and the one we are focused on is the Kentucky Turf Cup Stakes on Saturday (the name can be a bit confusing because it used to be called the Kentucky Cup Turf Stakes). It is run over a mile and a half and is a Grade III, which offers a tidy purse of $600,000 - with a bonus for Kentucky-bred runners on top of that. It is the 10th race on the card, with an estimated post time of 5:42 pm. The race has been a bit of a personal playground for trainer Mike Maker of late. He has won the race the last two years with Da Big Hoss, and this year he trains fully a third of the 12-horse field that has been entered, including three of the top four favorites. Maker will be looking for the three-peat, but not with Da Big Hoss, who is taking the year off due to an ankle injury. He'll be hoping that the race can be more of a stepping stone to the Breeders' Cup Turf than it has been, too - Da Big Hoss has been awful in that race the last two years, and despite this race being at the same distance as the big race, and typically drawing a solid field, no horse has yet to pull off the double. Maker's quartet: He has Enterprising (3/1 on the morning line), Oscar Nominated (7/2), Taghleeb (5/1) and long shot St. Louie (30/1). Interestingly, another of his runners, Bigger Picture, was long aimed at this race before choosing another at the meet, and I would have preferred him to all of these ones. Not surprisingly, three of the four Maker horses last ran at Arlington in early August, which was the site of the last big turf-centric meet of the summer before this one. Enterprising was fourth in the Arlington Million and had previously won two stakes races at Fair Grounds in the spring. He's trying this distance for the first time. I find it hard to get excited about him as a favorite. I have even more trouble finding positives in Oscar Nominated, who looked just awful in the Million, and the highlight of his year was a third-place showing in a Grade I. He does have a win over this track to his credit last year, though, so that's a plus. Taghleeb was second in the American St. Leger at Arlington but was far behind winner Postulation, who we will discuss soon. That race was 3/16 of a mile longer than this one, so distance isn't a concern. And St. Louie has definitely earned his price and isn't a factor. So, Maker has more quantity than quality in my eyes, and I will look to beat him. Postulation (9/2): My pick is Postulation. He won the American St. Leger by nearly three lengths and was cruising to do so. It was an impressive win. Prior to that he had won wire-to-wire over a mile and a half at Delaware Park in his debut in marathon distances. He's a horse that can run forever. He drew the rail here, which should suit him, as he won from the rail last time out. There is always a concern when a race sets up like this that he will be at a disadvantage strategically because Maker's group can work as a pack to their advantage. That could be an issue if Maker tries to set a rapid early pace, but there is still plenty of relative value, and he is the solid play to win.